On this day in 2009, Theofanis Gekas pleaded with Pompey for the chance to prove his Premier League worth. The 28-year-old arrived at Fratton Park five weeks previous – but had yet to feature in either the first team or reserves. The Greece striker had even failed to make the past two squads. It added up to a frustrating time for Gekas, who was on loan to the Blues until the end of the season. At the same time, Peter Crouch’s Premier League goal drought had stretched to nine games. A former leading scorer in the Bundesliga, Gekas was regarded as a natural goalscorer who sprung to life inside the box. And the hitman wanted the opportunity to show Pompey fans what he can do. Speaking to The News at the time, he said: ‘I didn’t join the club to be sitting on the terraces. Not even for tourism. 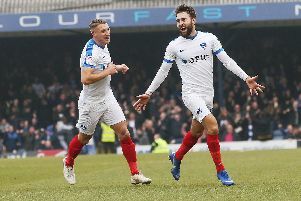 ‘I came here to try to help Portsmouth maintain their Premier League status and to find myself after almost six months of inaction with Leverkusen. ‘I understand the dismissal of Tony Adams didn’t help me. ‘It was a really bad coincidence for me, bad timing. ‘Mr (Paul) Hart doesn’t know me well and it’s normal turning to players he knows better. ‘But I am trying my best and I believe – through training – it is obvious my partnership with Peter Crouch can be really fruitful in attack. Despite his disappointment, Gekas insisted he hadn’t found it difficult to settle in England since his arrival. With close friend Angelos Basinas at hand, it had been a transition he found relatively comfortable as both players continued to adapt to their new surroundings. Basinas himself had started three matches, although was dropped to the bench against Chelsea, where he served as an unused substitute. The duo were regulars for ex-European Champions Greece, with Gekas racking up an impressive 13 goals in 36 internationals for his country. Despite Gekas’ inactivity at his new club, he was enjoying his time on the south coast. And he was quick to praise life in England. Gekas added: ‘I feel I am now settled and it’s feeling almost like home. ‘It didn’t take me much time to adapt. I like the city very much and I must say I am impressed with what I found here.